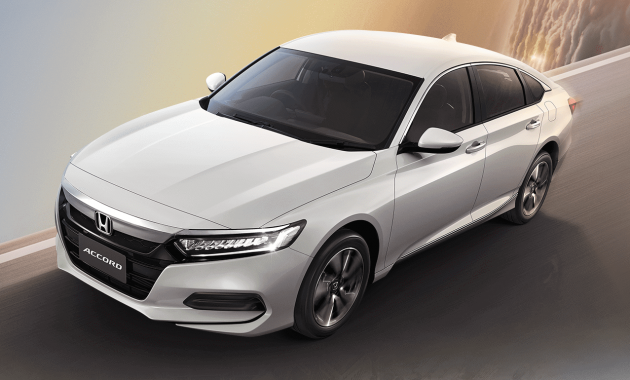 The 2019 Honda Accord has been launched in Thailand. The tenth-generation Accord ditches the 2.0L and 2.4L naturally aspirated engines from the previous generation for a 1.5 litre turbo engine and a 2.0 litre hybrid version. Similarly, the old car’s five-speed torque converter auto is no more – the range is now CVT-only. There’s no base NA variant. In Thailand, the Accord Hybrid goes up against the Toyota Camry Hybrid, which is priced from 1.639 to 1.799 million baht (RM210,659 to RM231,223). What do you think of the new Accord’s looks and powertrain options? Should bring in to mesia with 2.0 turbo engine. I don’t mind paying RM$200k for this car because Honda worked hard to produce this car from scratch. It did not take some China car and rebadge it. The Japanese have integrity just like the Scandinavians. The real next generation Game Changer from Honda. The all New Accord! Our Proton Perdana already outdated and Game Over also… Habisla Perdana!! Why compare 100,k car to 200k car bodoh …. Kesian my siam friends, RM193k to RM231k buy the honda. Rakyat Mesia so good luck, so cheap honda and petrol here. Yes so high integrity until they have so many scandals like Mitsubishi, Bank of Tokyo, Hitachi, Dentsu, Nissan etc. They are just as corrupt as all other car markers. Buy CVT gearbox car and change / overhaul gearbox after 3 years. Many estima , velfire CVT gearboxes going to grave in 3 year. Same goes to CVT of Nissan elmera, Sylphy , Teana and X trail. Yesterday spend RM 3000 to overhaul my Nissan Sylphy gearbox .will never buy any car with CVT gearboxes. Do they now? Scandanavian Autoliv airbags has way much more integrity than Japanese Takata airbags. Honda is at least more honest than certain carmaker that was set up to take advantage of the national car status and tax relief. Not one model of this carmaker was designed by Malaysians. The engineers based in Malaysia are told to design new bumpers only. And a certain troll keep praising this carmaker like it was a god’s gift to us. The truth is far from that. Like a Civic front, merged with Proton Perdana rear and hidden inside is a BMW F30 interior. Agreed! better buy my Camry liao!! Toyota got higher RV and is more reliable one leh. when you balik kampung with a Toyota, people will view you as a successful person.. Your Camry looks like a monster catfish that crawled out from the Mekong river. One is ugly, yours is hideous. It doesn’t make the choice any better, only worse. Both Camry or Accord, 30% cheaper in MY. My kampung in KL, need to drive a Merc or Ferrari only people think is a successful person, not a Toyota. People will view you as a fool with his money because they know that topping up a bit more will nab you a better car from Mercedes Benz or BMW. Well if Ford, General Motors, and Chrysler had managed their businesses better, they wouldn’t be begging for duit kerajaan. Perhaps they needed a foreign CEO to run their company. I was surprised with the fact saloon is still selling like a hotcakes in the states while most consumer prefer SUV over this. Where is the 2.0L turbo version? RM$200k in Malaysia. Same region as BMW and Mercedes already. 200k in thailand laaa. Apa kena mengena dgn DRB ni? Honda raised their price to nearly RM200k because China Geely X70 already RM123k. Interesting theory. Do elaborate how did X70 pushed up Thailand Accord prices to nearly RM200k. Does it have some sort of magical influence on pricing in markets where it haven’t entered yet? 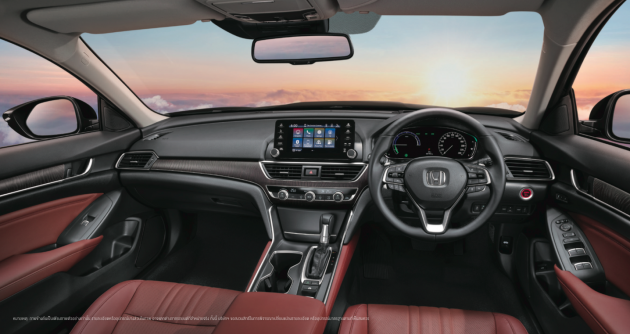 This new accord is better than the entry BMW and Merc according to many expert reviews. The refinement is more superior and on par with the lexus ES and E class. Japanese cars quality now are way way better on par with luxury marque looe Audi BMW and Merc. Expect to pay a premium to own one Japanese car from now on. You want cheap, get the X70. Bro BMW and Mercedes going up in price lah. For 228k u only can own a small 1300cc Mercedes A200. Imagine what the new C200 price will be when it comes out. why are they (toyota, honda and the like) offering the 1.5 turbo engine for this category of cars. It should be minimum 2.0 turbo and above. is this part of the world market a dumping ground for these corporation? Why yes. Because we have blinded Japanese fanboys that will lapped up all these garbage thrown by Japan. Seriously? If Thailand price already 193k how much it will cost in Malaysia? Camry the nearest competitor for Accord also 189,900.. With these kind of price,expect Merc & Bimmer sales would significantly rise. Bro just check when the new CR-V was launched in Thailand – the prices when converted directly to MYR was around RM180k to RM210k-ish, but see the actual prices in Malaysia, it was more like RM145k to RM170k for our CRVs. i believe 2.0T will only be available to North America. Not asians but Asian branded cars. Mercedes & BMWs here have long switched out the gear shifter but you don’t see any asians complain about it. Japanese cars are still lagging conti brands. Same engine as the Civic turbo? Wow, underpowered for sure. I have 1.5 turbo CRV… it is easily catch up with 2.5L car in east-west highway, Karak Highway and Genting road . No way it will be underpower. just because u can move at the same speed at normal public road doesn’t mean anything. Most 2.5l D-segment car owners don’t even press more then 20-30% of their accelerator pedal, hence the stereotype uncle car, uncle driver. Ever heard the term there is no replacement for displacement? turbo is just forced induction of air, your engine is still a puny 1500ml area for combustion as compared to a massive 2500ml of EASY combustion just to produce the same power as you. Do you know what happens when a 2.5l car floors it? Market is trending towards SUV. Hence the small projected sales number will naturally lead to a higher selling price of the these cars, both Camry and Accord. Expect the same playing field Germans to move up the price bracket too. The 2.0 Hybrid Tech looks good. Will Honda bring them here? Will the CKD hybrid tax exemption remains for this car to be assembled here? Hybrid tax exemption no more edy bro. City hybrid prices now is higher than V Spec price. Hybrid CKD tax exemption was quietly rescinded. You can see the City hybrid prices have increased now. It’s a Honda, expect poor reliability and bad build quality. I would know from first-hand experience. If you were looking at buying a Honda, just… look elsewhere. anytime this honda accord turbo is faster than the toyota camry. another one bites the dust … due to protectionism. Make Toyota/Honda Luxury again. Am i the only one seeing the back of this new accord similar like saga boot? Looks like saga boot design influenced this new accord boot design. Hmmm. So excited to see the 2.0L hybrid is near, hope that it’ll cross the border. How’s the the price of the 2.0L hybrid compare to the price of the previous 2.4L NA? Setting our expectation. The back looks really bland, like it should belong on a Honda City or something. Doesn’t resonate as being something flagship. Also, the fastback shape works well on a Civic, but here it just looks fat. The price in Thailand after conversion is higher nowadays mainly due to the currency exchange rate. MYR vs THB is getting lower and lower. As for this Accord, I would say the new Camry is way better overall. WHAT?????? 1.5 turbo n 2.0 hybrid???? was looking forward with the 2.0 turbo….. a huge disappointment…. bring in the 2.0 turbo.doesnt matter price at 200k. manageable as the cc not like 3.5v6 like last time. else, option to order and covered by warranty. Ok but when will they launch the new Jazz though? Hope it doesnt end up locally assembled and owners getting every creaking and banging noise being explained off as normal or better, the service technician experiencing temporary loss of hearing when taking the vehicle for a test. This is basically my ownership of a damn Honda. Useless localised japanese brand is what i would call a celup jepunis because the hopeless quality is just like the funny tiger logo brand. Some say tiger logo x70 is better than Conti. Many car journalists in the US nowadays always talk about the disappearing market for mid size sedans.. With ridiculous price tag and packaging offered for our SEA market, it will disappear much faster here. D segmenter here is questionable, why should one buy one if C segmenter like Civic is large enough for a family? Shame Honda SEA is not bold enough to launch with the new type electronic gear shift buttons as found in US models. Most unkers wouldn’t stick shift even in Sports Mode, besides there is already the steering paddle shifters. But good to see the Volume knob returning on the head unit (as there was an outcry in US Civic pre facelift models). The electronic buttons are only on the 10-speed automatic, paired with the 2.0 litre turbo engine. Models with CVTs all get the normal gear lever, even in the US. Mazda 6 is way better looking. Why always thinking of buying Accord and Camry only??? ?